As an eco-activist for half a century, I like many of my peers expected society to take obvious steps needed for protecting the earth. Like others, I realized that we have limited amounts of clean water, air, and soil on our planet; that what we do to the earth and our animal kin, we do to ourselves. This truth is the big truth around which so many philosophies revolve worldwide, and which all indigenous traditions teach: the inherent unity of The All. Becoming an Earth guardian at 14 was a natural personal fit. I lived among animals, the fields and Eastern woodlands my entire childhood and navigated with joy the unbounded harmony and love of life such a deep relationship brings our hearts. But instead of society progressing down a straight line these past 50 years toward protecting the sacred Earth, there has been an uphill, downhill journey, which now it seems is careening madly off course. Since I first became and activist by handing out flyers in 1965 for a program being given by Ralph Nader on acid rain hosted by the South East Community Organization in Baltimore where I was a young volunteer, there has been a rapid diminishment of the ecosystems, our natural resources and wildlife worldwide. What we have learned since then is sobering and alarming. We are all called to action beginning in our own hearts and communities. Westerners in particular have been focused on impacting the outer world and dominating the landscape. Adopting new ways of relating to the world is our task at hand. His Holiness the Karmapa, Ogyen Trinley Dorje, explains the link between our hopes and actions in his eloquent work Interconnected: Embracing Life in our Global Society. As he shows, while we may be inspired to do a good thing, following through with action depends a great deal on each person’s inner qualities that lead to compassionate action. The inner life of each person and the outer world we create together, are interconnected and interdependent at all times. (Interconnected: Embracing Life in our Global Society, The Karmapa, Ogyen Trinley Dorje. When I began my own efforts as an Earth steward, a cause to which I have dedicated my life, I mistakenly believed that if people simply were given the right information about any particular problem, that the response would hearken up a “we can do it” attitude. Unfortunately, as with many other elders in the activist communities burnished by decades of effort for the environment, for social justice, for workers rights, consumers’ right to know, animal rights and the Earth’s unequivocal need for our right action, we have discovered that information alone is not enough. It was not enough to argue nursery school understandings such as dumping poison in the water poisons the water. Though all life is dependent on clean water, it has not mattered more than cutting corners and lowering costs to companies and municipalities who contaminate our waterways worldwide. It was not enough to acknowledge that allowing toxic effluents into the air contaminates the air and destroys the lungs of children and adults. We were not successful in stopping nuclear proliferation on land and in space and all the horrors such weaponry and technology pose for centuries to come. The list of such unacceptable risks and violations of the “public trust,” seems endless, together constituting the reckless endangerment of all life. I share this for its essential lesson. Most people need to feel, in some emotional sense, how each issue affects their own lives so that the issues become more personal. So my advice when encouraging others to join in becoming an Earth guardian is to share real stories about real people. Information is not enough. Touching people’s hearts is essential. We can celebrate the activities by millions of people around the world today and who in every state of our nation, are using the state and federal courts to challenge transgressions; who are saving animals and their natural habitats; who grow and distribute organic foods; who fight for social justice as part of the ecological imperative. It is a fact that when any one of us improves the world anywhere, the entire planet benefits. We are planetary citizens in our local habitats. Often, when people get involved in these various ecological, and social justice issues, they can grow very disheartened seeing progress in one area followed by failure or setbacks. Many of us are alarmed about the current administration’s misbegotten endeavor to revive the outdated, dirty, unnecessary and life-degenerating coal plants in America, among other rollbacks to both science and law enforcement for a better, cleaner environment and more just world. From the activist and spiritual interests I have pursued since childhood, I have learned to appreciate the time it can take for change to occur. But at this moment in time, emergency measures are called for. The White Spirit Wolf taught me that what the Earth needs now is CPR: conservation, preservation and restoration. In his magnificent book The 8 Laws of Change, Stephan Schwartz explains what the abolitionist and civil rights movements, women’s vote, public education, public health, and Greenpeace share in common. A few Quakers who wanted to improve the world for others began all of these movements. Schwartz discovered eight basic laws that appear to govern the Quaker philosophy and that were applied in these instances, but are not exclusive to them. Schwartz asked the question, “How does a small group of people actually change the world?” He spent almost two decades searching for the answers. Mohandas Gandhi and Martin Luther King and their hundreds of thousands of supporters did it. They instigated successful change against tyranny. How? By making a conscious effort to embody the qualities they wanted to see in the world and, unlike the American revolutionaries who also seized freedom from oppression, these movements were all done by foreswearing any and all violence. Schwartz found eight principles that these historic group efforts were guided by, successfully changing laws and the behavior of individuals. These principals are in alignment with those of countless spiritual communities across the ages, as well as with the basic nature of the animal communities and the societies that revere them. Here are the eight laws of change. First Law. The individuals, individually, and the group, collectively, must share a common intention. Second Law. The individuals and the group may have goals, but they may not have cherished outcomes. Third Law. The individuals in the group must accept that their goals may not be reached in their lifetimes and be okay with this. Fourth Law. The individuals in the group must accept that they may not get either credit or acknowledgment for what they have done and be authentically okay with this. Fifth Law. Each person in the group, regardless of gender, religion, race, culture, must enjoy fundamental equality, even as the various roles in the hierarchy of the effort are respected. Sixth Law. The individuals in the group must foreswear violence in word, act, or thought. Seventh Law. The individuals in the group and the group itself must make their private selves consistent with their public postures. Eighth Law. The individuals in the group and the group collectively must always act from the beingness of life-affirming integrity. As Schwartz points out, groups of people all over the world have undertaken positive change using these principles. Perhaps they did not identify them in the same way, but in essence they embodied them in their own culturally unique ways. If we remind ourselves of these guidelines, we will be less frustrated with the pace of change and more likely to have hope and appreciate the rewards of our efforts, which will extend beyond our own lifetimes. This is important. We may not desist from right action, but we must also be forgiving, courageous,and inventive while, as White Wolf made clear, administering CPR to the earth; conservation, preservation and restoration. This is the shared work of Earth Guardians worldwide. 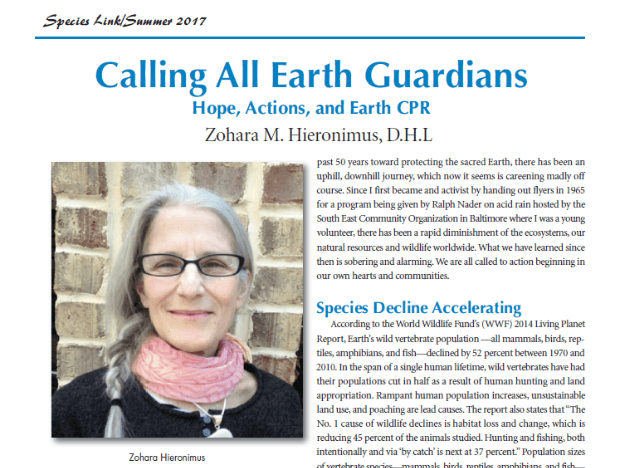 Visit the Species Link Journal website.